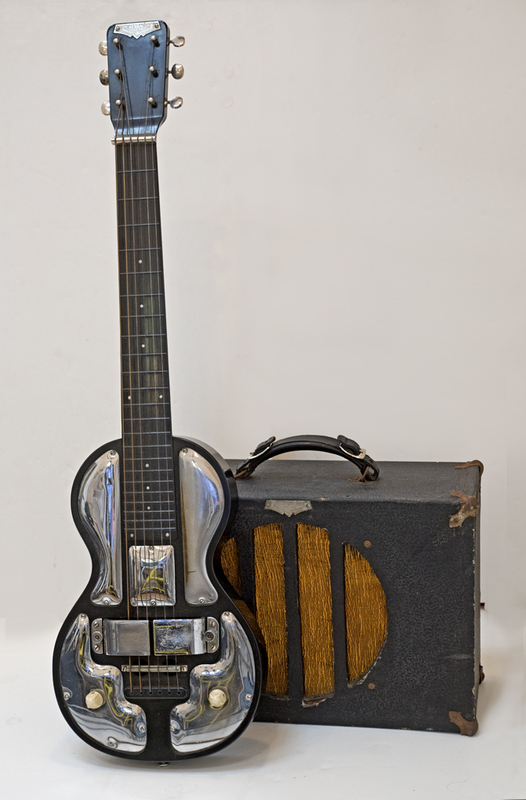 1930's Rickenbacher Style B lap steel, Bakelite with chrome metal plates and desirable 1 1/2" wide horseshoe pickup. 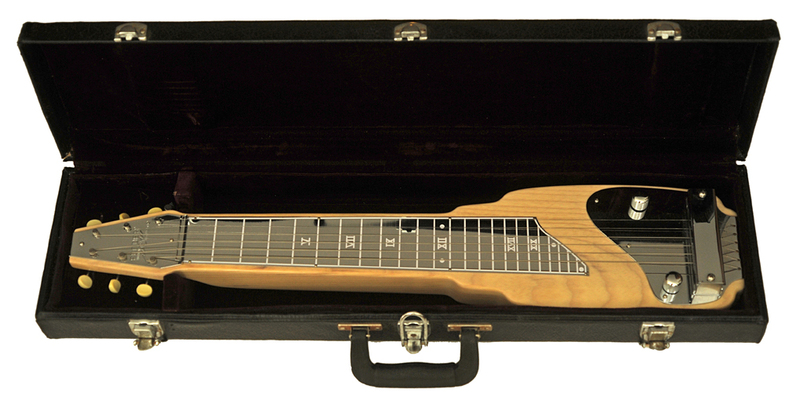 1930's Rickenbacher Style B lap steel, Bakelite with white plates and desirable 1 1/2" wide horseshoe pickup. It's also a very special one. 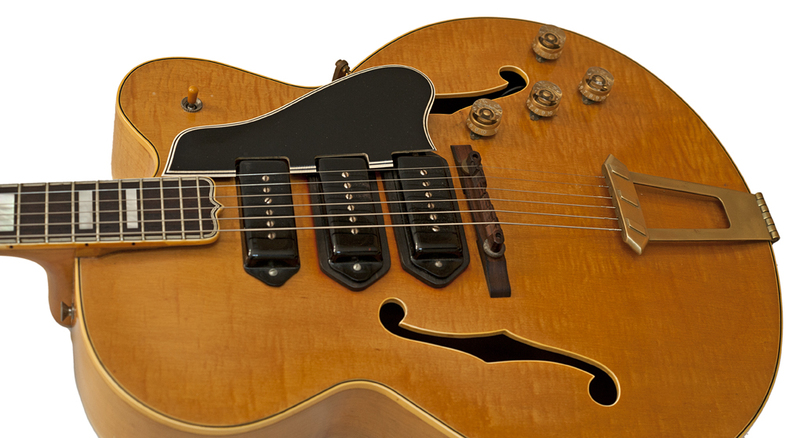 The early pre-switchmaster ES-5 is a wonderful guitar, but very impractical in it's limitations. A lack of a switch to select pickups means having to adjust individual volume controls and then re-adjusting the tone controls every time you want to solo or change pickups to get a new sound. Fortunately, I was lucky enough to receive an education from my friend Duke Robillard, who T-Bone Walker's biographer has called T-Bone re-incarnated. Duke advised me to add a pickup selector switch, but it didn't end there. I had no idea how complicated wiring electrics could be. 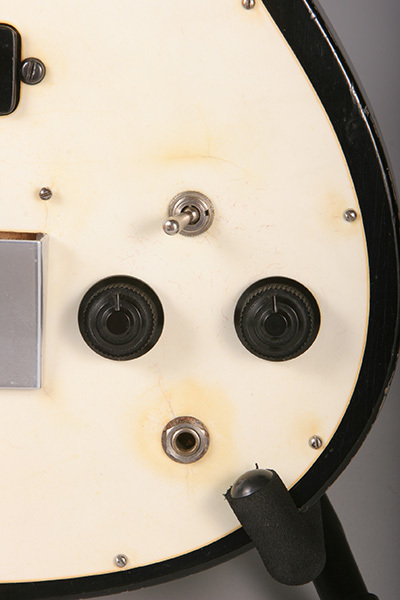 Wiring pickups is not nearly as straightforward as one would think. Duke also calculated and explained to me how to wire the electronics to allow for selecting the most useful combinations of pickups, taking into account how changing one setting can affect another. Absolutely nobody knows how to make a guitar work the way Duke does, and it didn't hurt that Duke set me up to have his most trusted luthier do the work for me. Working together, they did a magnificent job. The guitar is in wonderful condition, complete with gold waffle tulip button tuners, and is all original with the exception of the work Duke suggested. With original "Charlie Christian" pickup. Cosmetically fair, plays well. 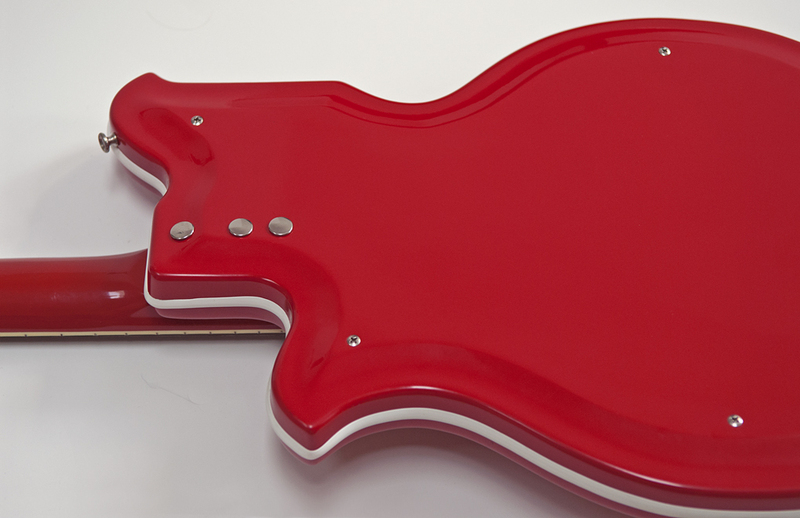 With it's fiberglass body, the National Newport, with it's body shaped like the USA, is definitely among the coolest and most innovative guitars in history. In beautiful all original condition. 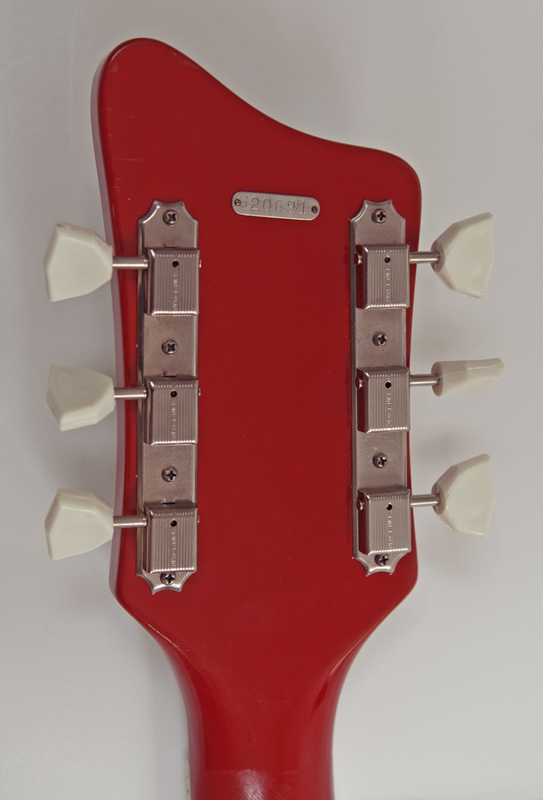 Produced for a mere two-year period, the fiberglass-bodied Newport 82 evolved from the Val-Pro 84, and features a highly-polished Pepper Red fiberglass exterior, a single "standard" pickup, controls on the bass side of the body, an adjustable Rosewood bridge, an asymmetrical ("Gumby") plastic veneered headstock profile, and vibrato tailpiece. 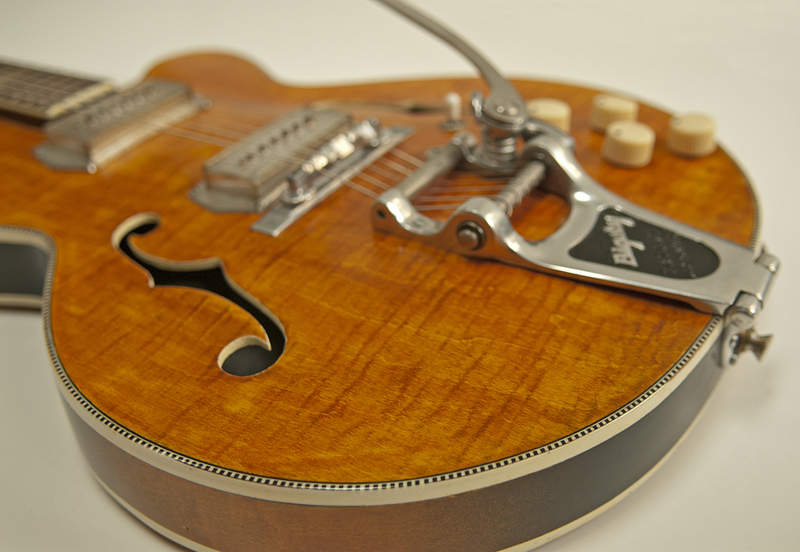 Like many National guitars, the Dynamic combines a large single coil pickup with a pickup under the bridge. 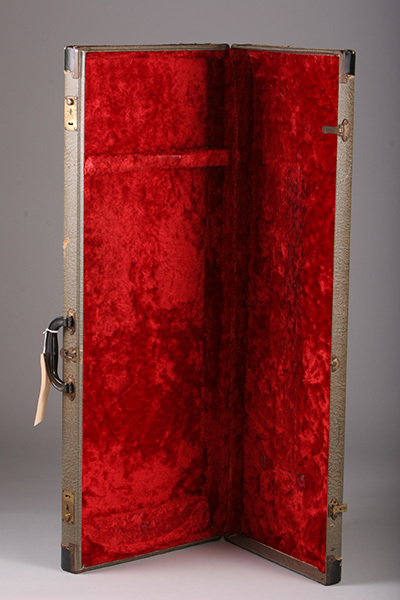 The wine red version with stickpin logo and insets for screw-in legs was produced before the Dynamic was discontinued and then reintroduced in the 1960's. Bakelite with white metal plates. 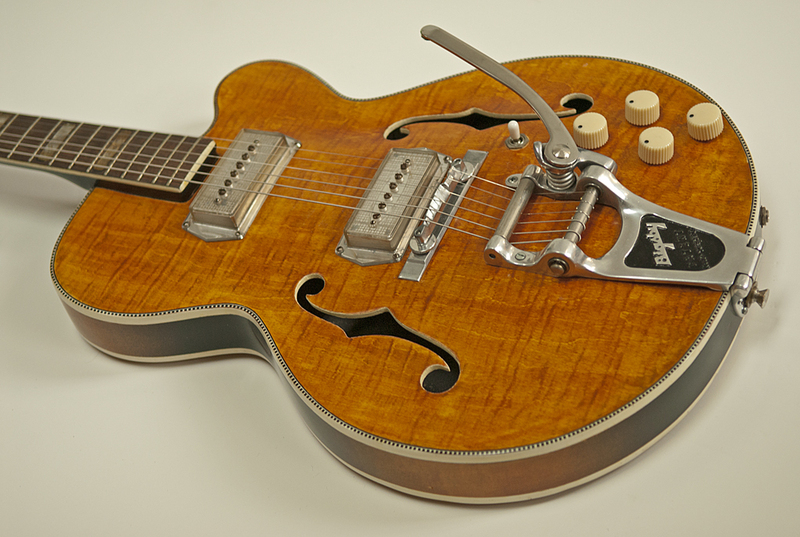 The desirable pre-war version with 1 1/2" wide horseshoe pickup. An important piece of history. Less than 100 made. 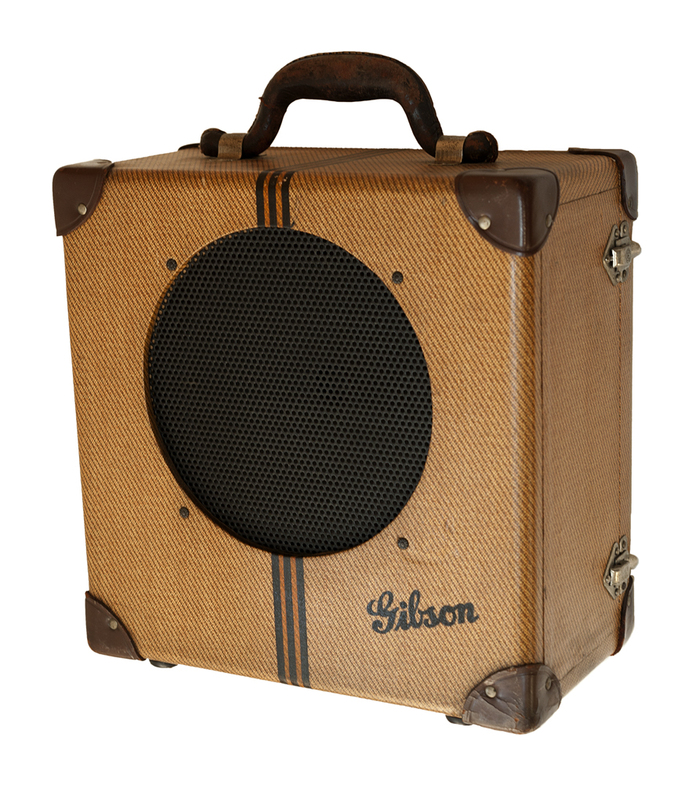 The next and most popular major version of the early Gibson amp, with rounded top corners. 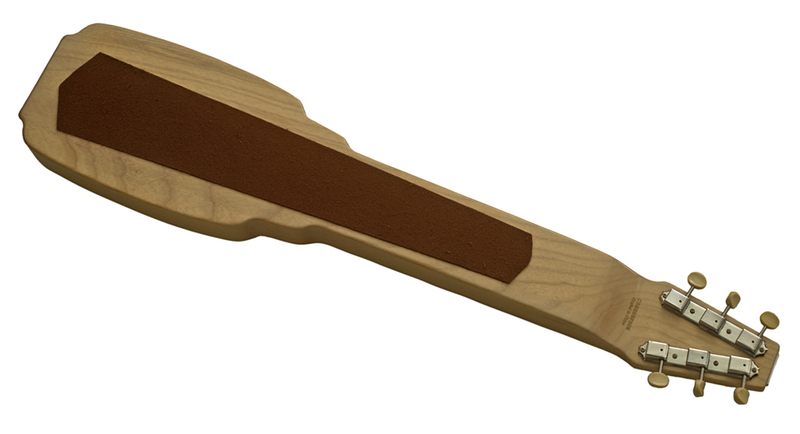 With beautiful molded leather handle and leather corners. Separate microphone input with volume control. 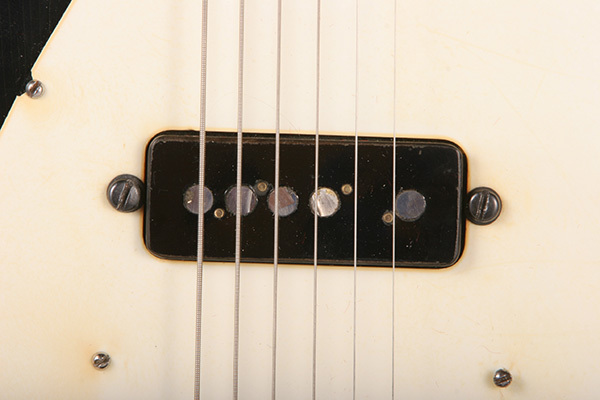 With 1 1/2" Horseshoe Pickup, in immaculate condition. 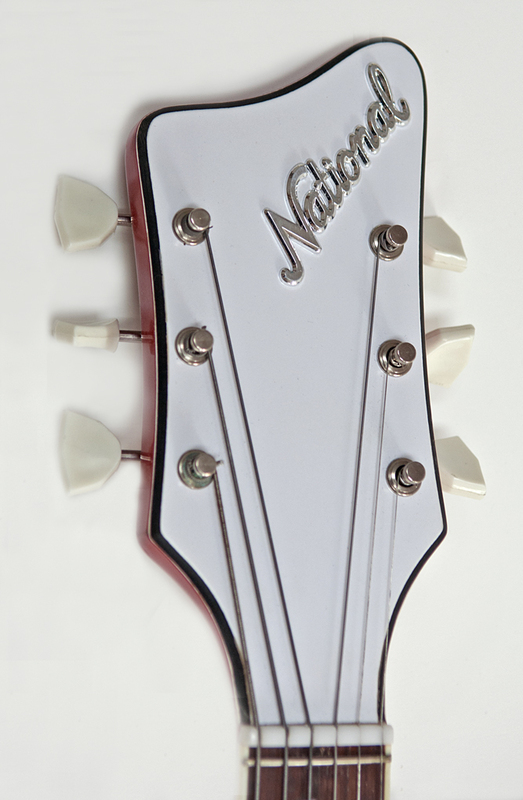 A rare variation with a Spanish style round bolt on neck replacing the flat neck of the lap steel version, considered to be the first commercial solid body electric guitar. 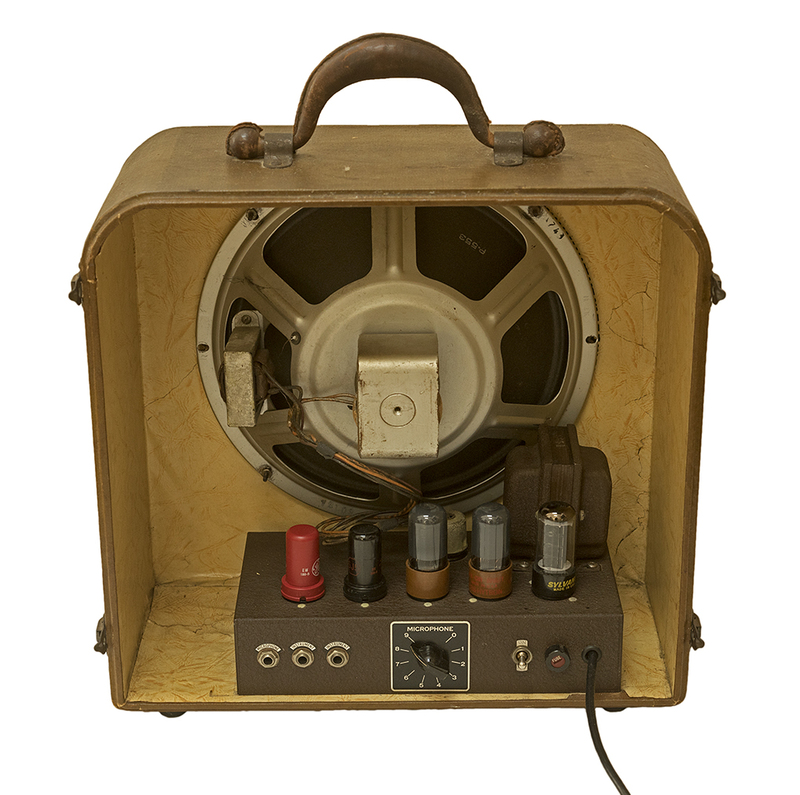 As originally supplied with early Rickenbacher amplifier. 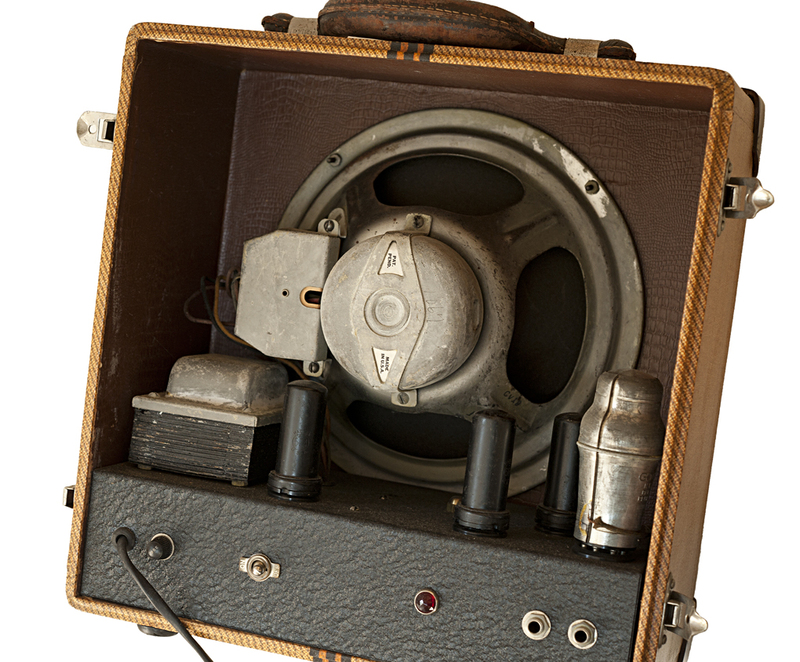 There is no substitute for the amazing unique sound of a vintage 1930's 1 1/2" horseshoe pickup Bakelite Rickenbacher played through a matched 1930's Rickenbacher amplifier, a '50's Telecaster played through a tweed Fender amp, or a 1930's "Charlie Christian" pickup Gibson played through a 1930's Gibson amp, as far too few people have experienced. 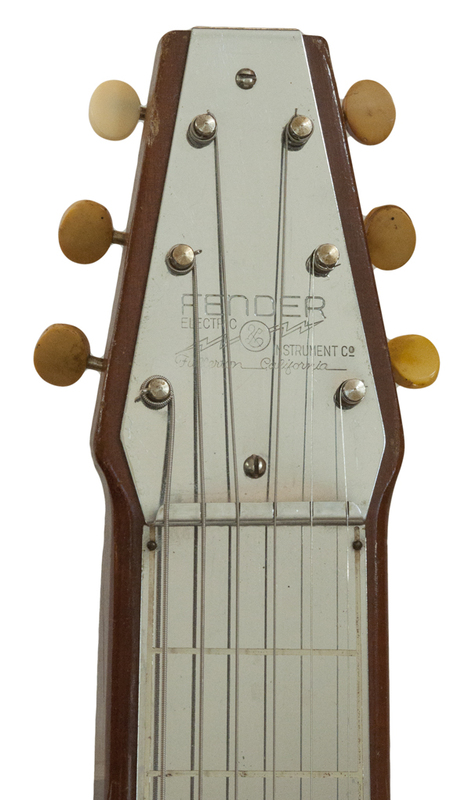 Rickenbacher produced only a small number of Bakelite solid body guitars with the conventional round neck. 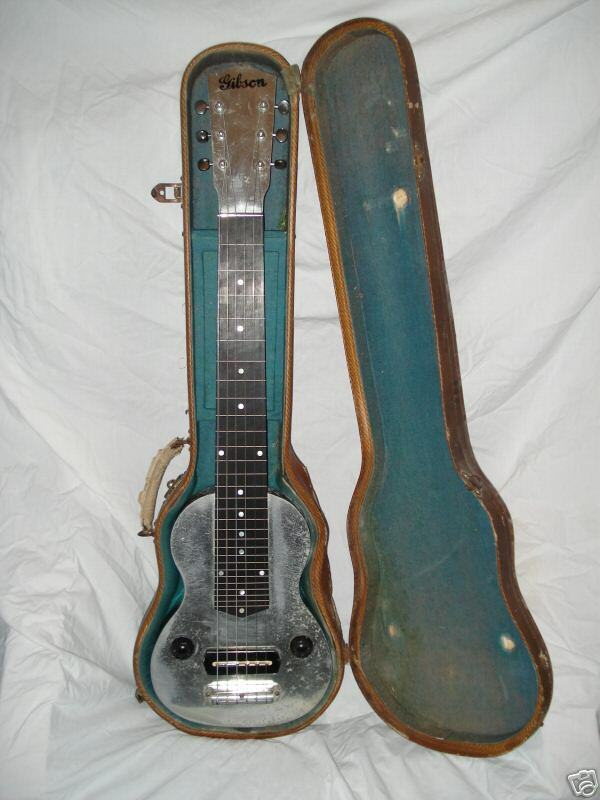 This 1935 Electro B Spanish is the very rare round neck version– it is not a square-neck lap steel. 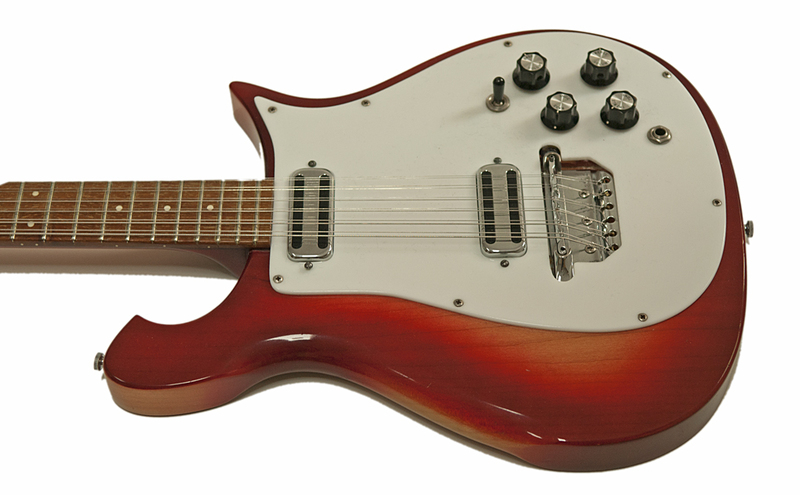 This significant model by Rickenbacker is considered by many as the first real solid electric guitar,. 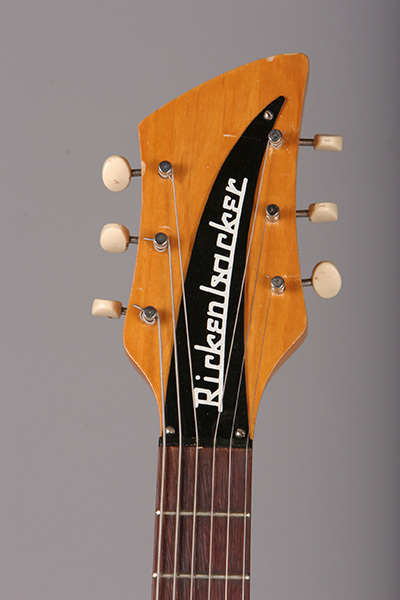 Noticeable features include the old spelling of the name “Richenbacher” – now commonly seen as “Rickenbacker”, and a string through design and bolt on neck that presaged the Telecaster made by his California neighbor Leo Fender. 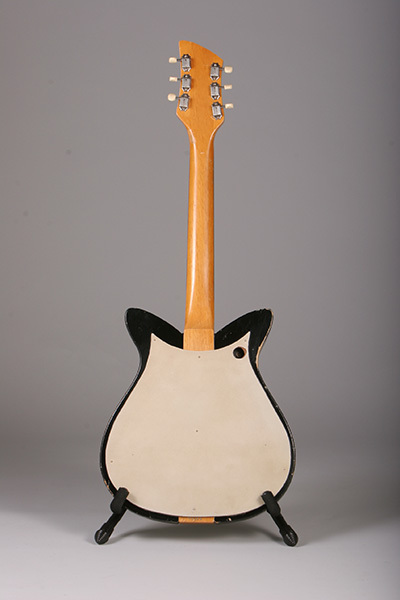 A Bakelite version of the Model B also with 1 1/2" Horseshoe Pickup, bolt on neck, strings through body, and five white plates. 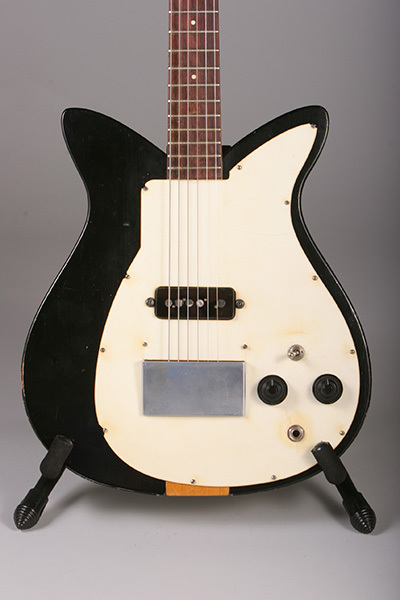 Many lap steel players, particularly David Lindley, consider the 1930s Rickenbacker Model B Bakelite model the best sounding lap steel ever made. 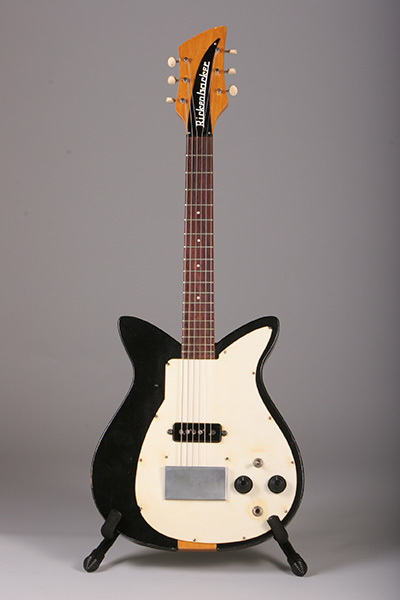 This Bakelite version of the Model B, featuring the pre-war 1 1/2" Horseshoe Pickup, bolt-on neck, string-thru-body design, and white plates, is nearly identical to Lindley's favorite six-string Rickenbacker. This instrument is in beautiful original condition with white metal plates, concentric tone and volume controls, original Waverly "Clover" tuners, and painted fret lines in perfect condition. 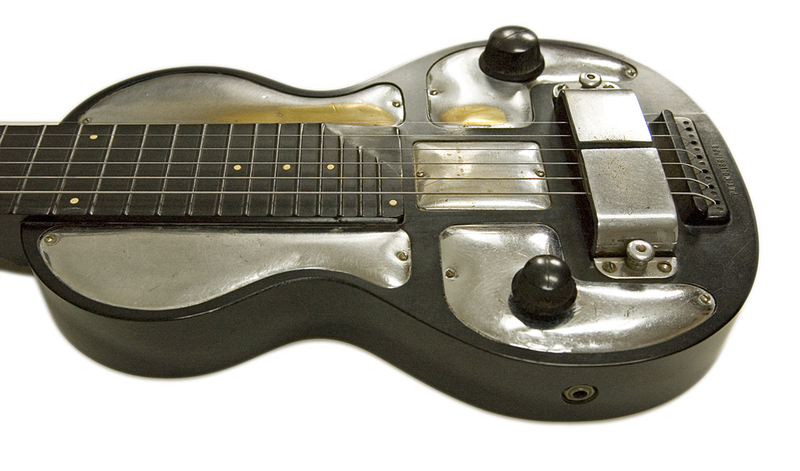 A Bakelite version of the Model B also with 1 1/2" Horseshoe Pickup, bolt on neck, strings through body, and five chrome plates. 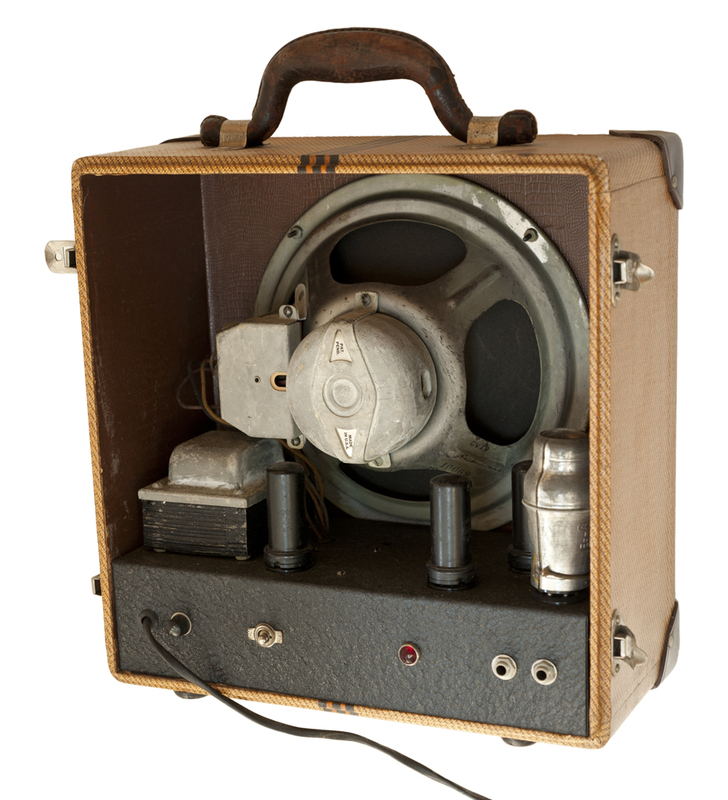 In beautiful original condition with natural wear and no damage, this early version, with chromed metal plates, "arrow" opposing side tone and volume controls, output jack facing the player, and original Grover hexagonal tuners, preceded the white plate version. 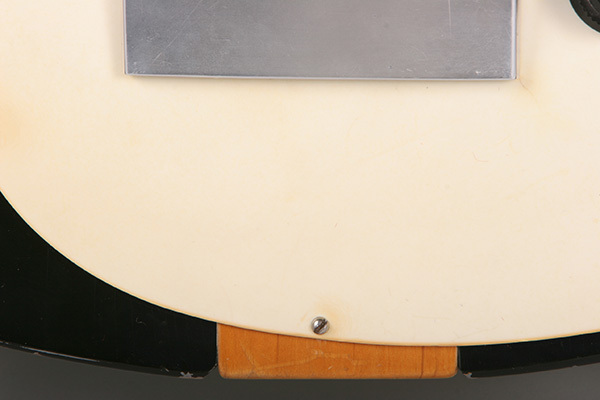 Notice the Rickenbacher influence on Leo Fender's Telecaster, with the bolt-on neck and string-through solid body. 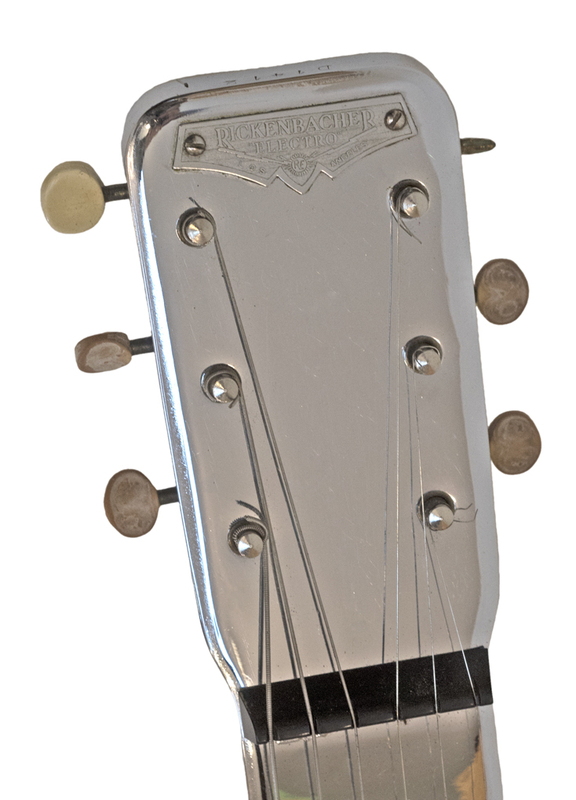 A chrome version of the Model B with original black and white tone and volume controls, original tuners, also with desirable 1 1/2" pre-war Horseshoe Pickup. 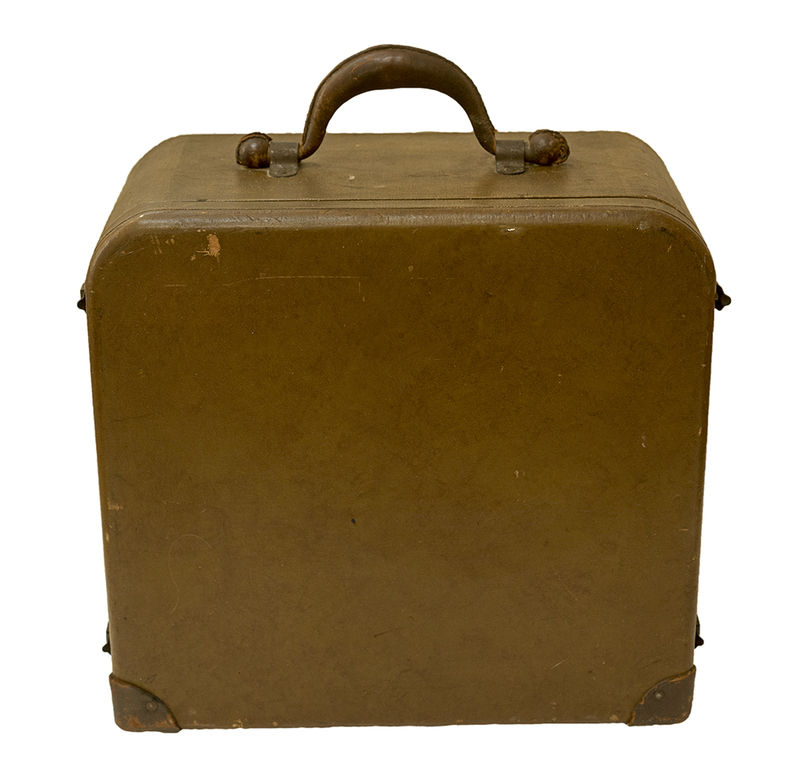 Discontinued after World War II. 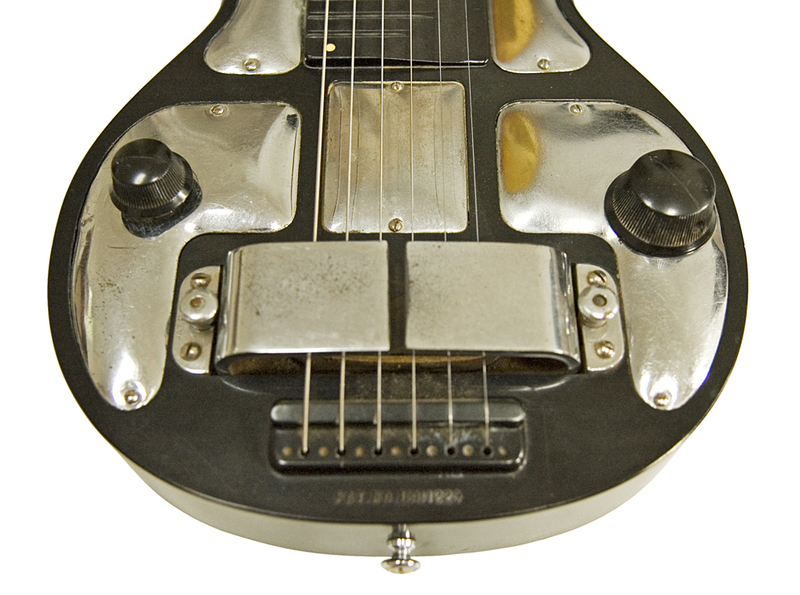 First produced in 1937, Rickenbacker (nee Richenbacher) made this model with body parts stamped out of sheet metal. 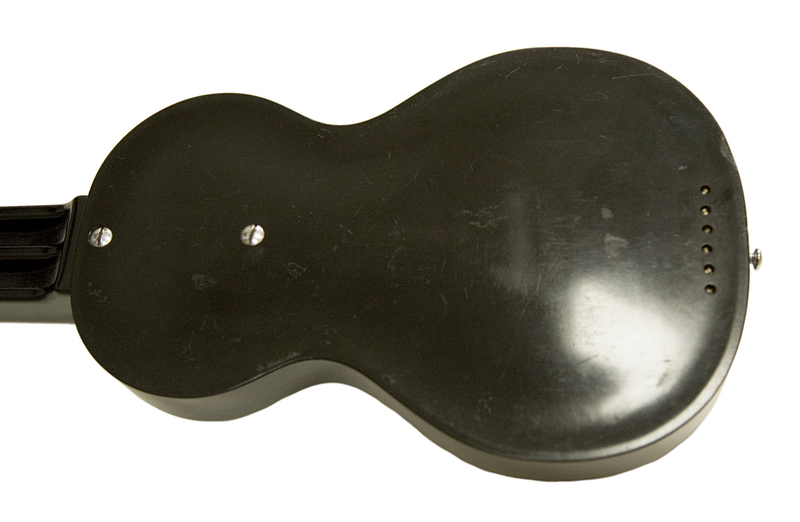 The stamping process was economical and the instrument was often stuffed with crumpled newspaper or tissue paper in order to eliminate unwanted resonances while playing. 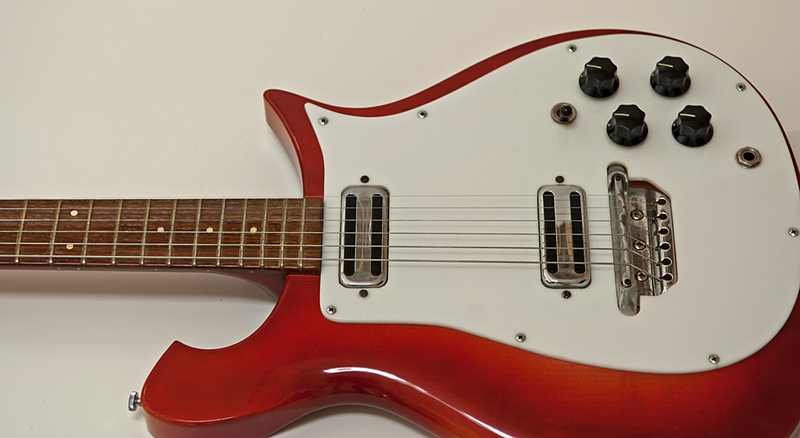 Though not a budget model, the Silver Hawaiian has 35 frets and a chrome-plated hollow body. 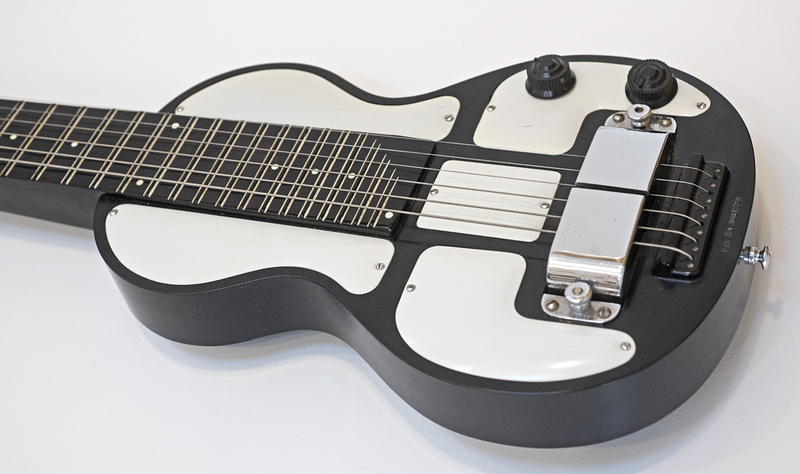 The first of these models had single black volume control, but by the time this guitar was made in 1939, it featured a white tone control as well. No case. EXC; shrunken tuner buttons (4), one missing tuner button. New “Vintage” tuner buttons and easy to follow instructions provided, slight rust near pickup. 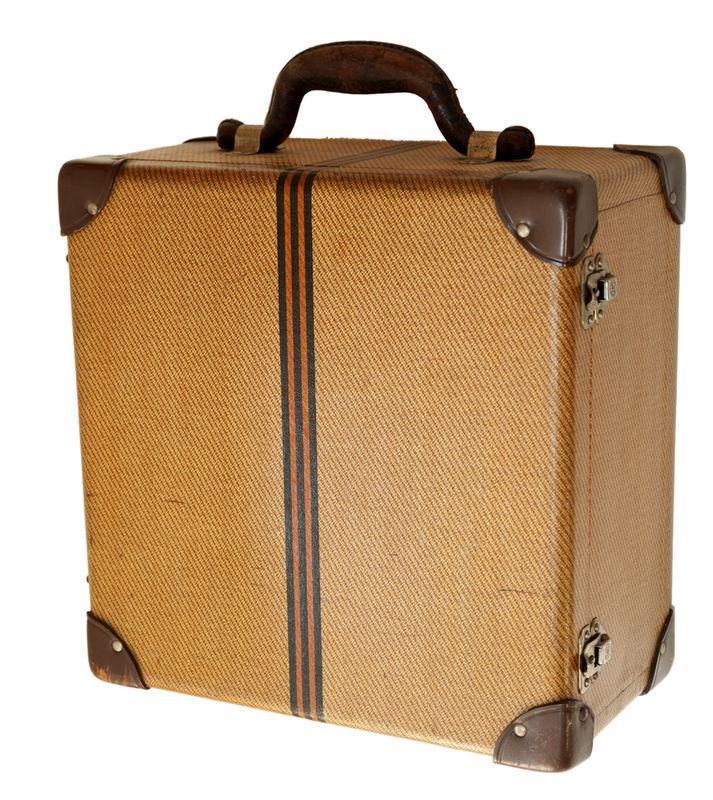 With legs and original tweed case. 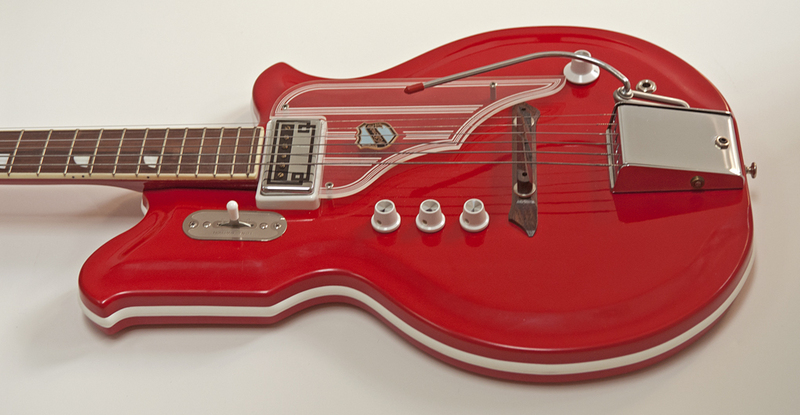 One of three short-scale guitars that were introduced in 1957. 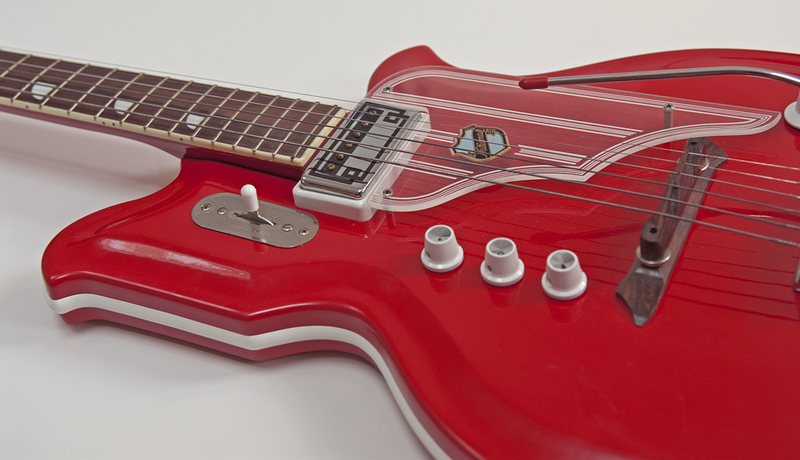 The Model 1000 has one pickup and a neck-through body construction. 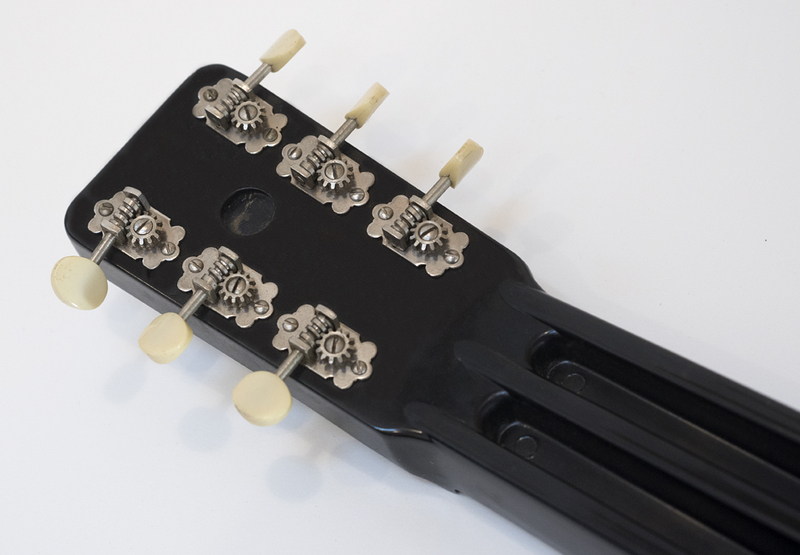 The production models were three quarter size tulip-shaped guitars with a one piece maple neck, a Brazilian rosewood fretboard with 18 original thin frets, and white dot position markers. 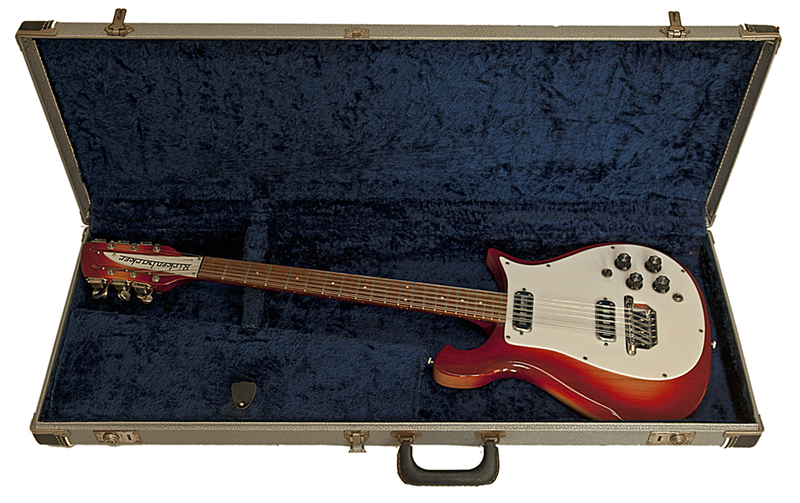 Rickenbacker amended the shape slightly in the last part of the year to include a new "cutaway" feature. Original colors included brown, black, gray, and natural. All original with minor wear, original silver case. 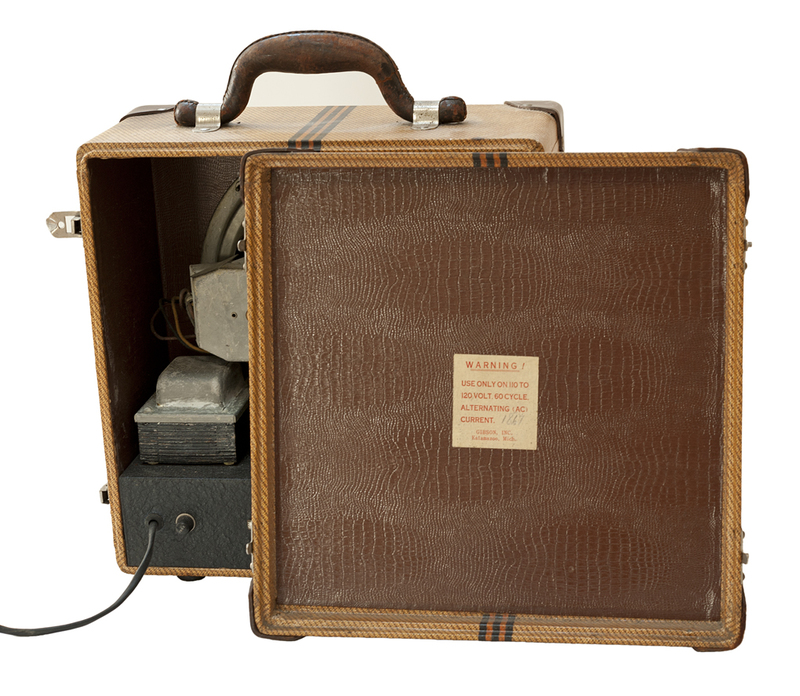 In 1944, Doc Kaufman, who designed the first guitar vibrato and "ViBrola" for Rickenbacker, and Leo Fender, a radio and phonograph repairman, received a patent for a new style of lap steel pickup. 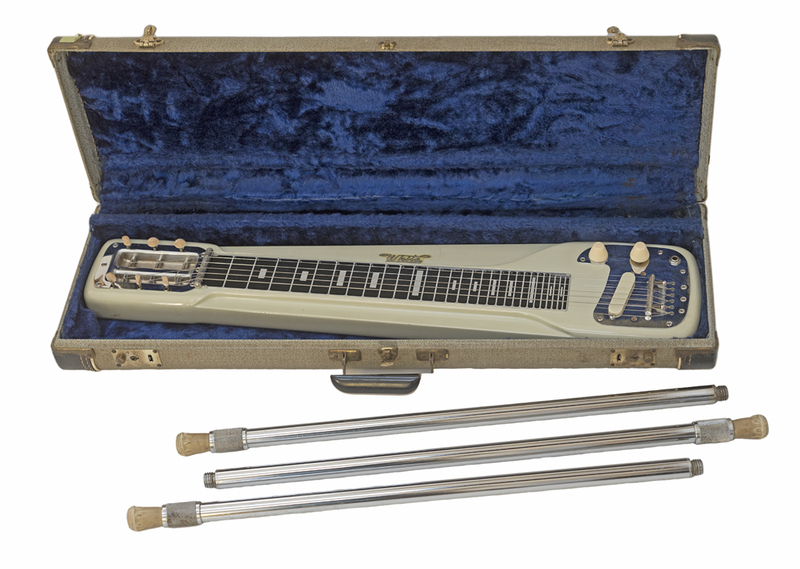 In 1945 they set up shop as K&F Manufacturing to produce their new lap steel, but one year later Kaufman decided to leave the fledgling company. Leo renamed his company Fender Electric Instruments and, as they say, the rest is history. 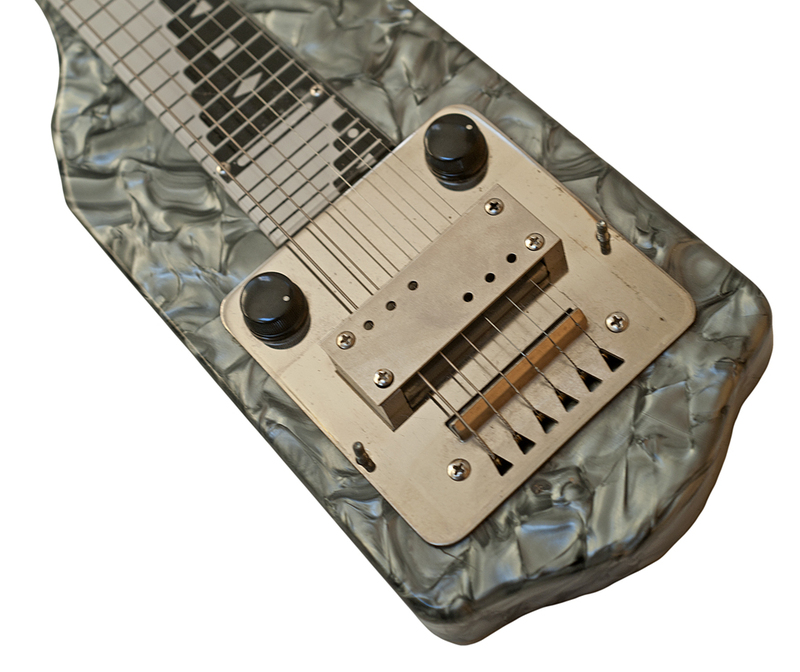 That history started right here with this K&F Lap Steel. 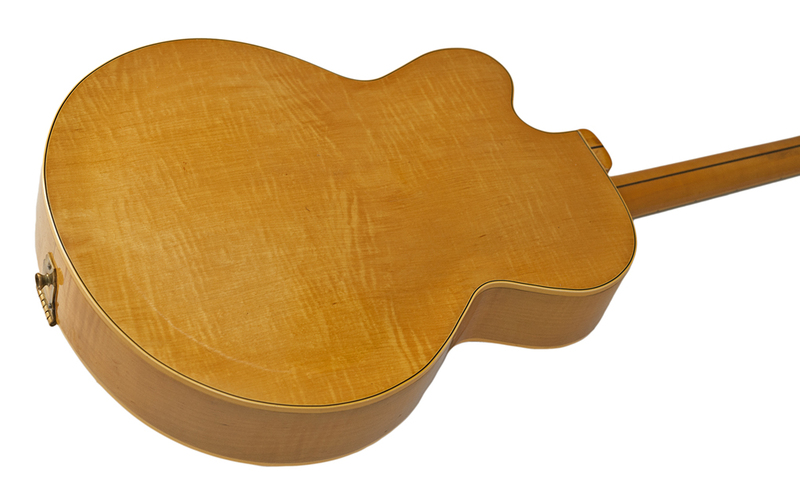 Made in 1945 at Leo’s home, the body is made from maple and the frets are painted directly onto the fingerboard. 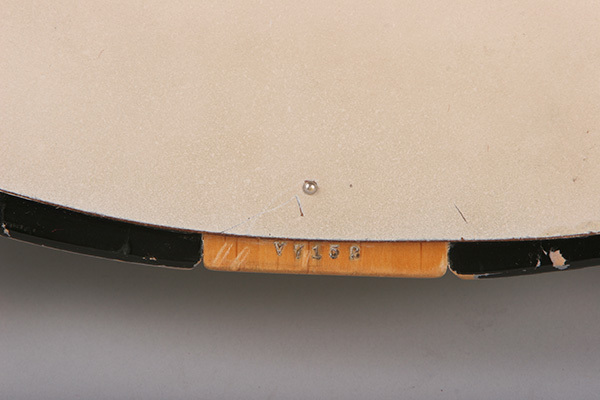 The headplate is bent at one end to form the nut, the kind of clever manufacturing solution that Fender would use time and again as he reinvented the solid body electric guitar. 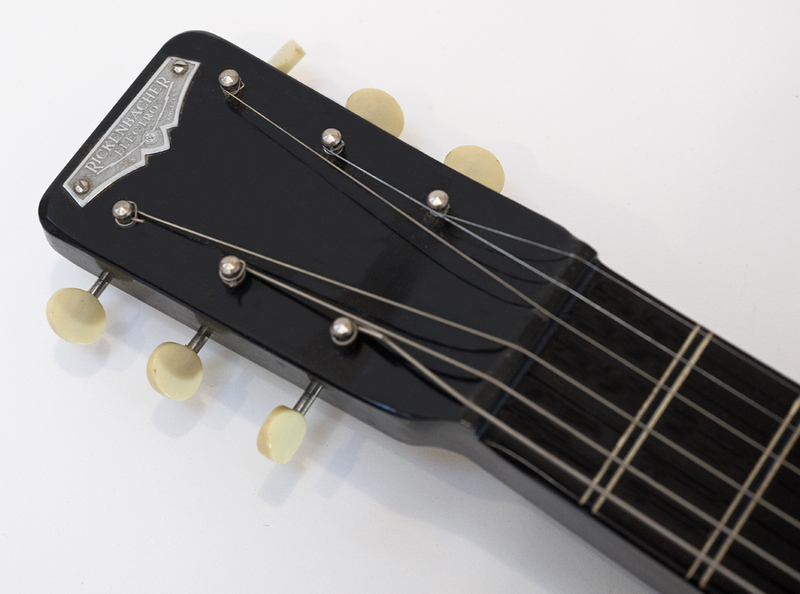 This guitar has the Kaufman and Fender pickup, a style where the strings pass through the magnet in a manner that recalls the function of Rickenbacker's horseshoe pickup. 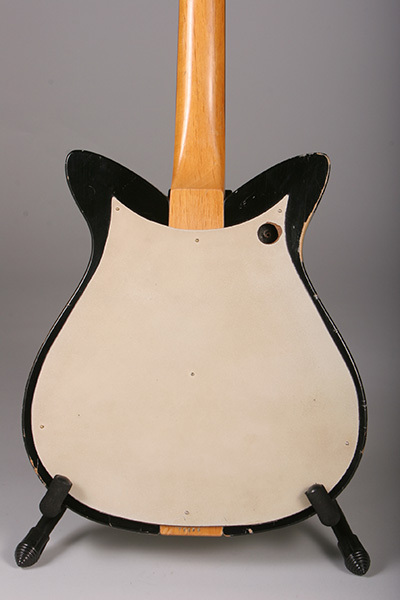 K&F guitars are quite rare, and this model exhibits the design for the single-coil pickup that Fender eventually stopped using years later after his namesake brand established itself in the guitar marketplace. 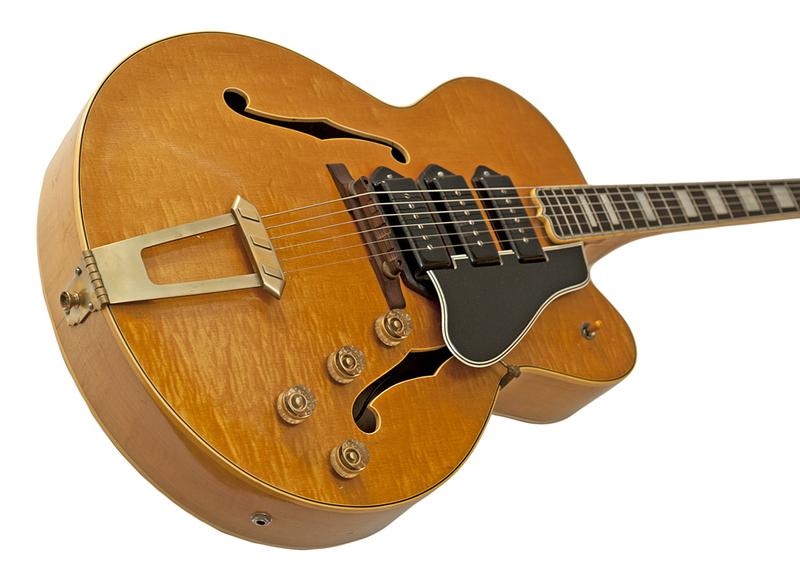 This guitar is number 501 of about 1000 guitars produced before Leo formed the Fender Musical Instrument Company. No case. 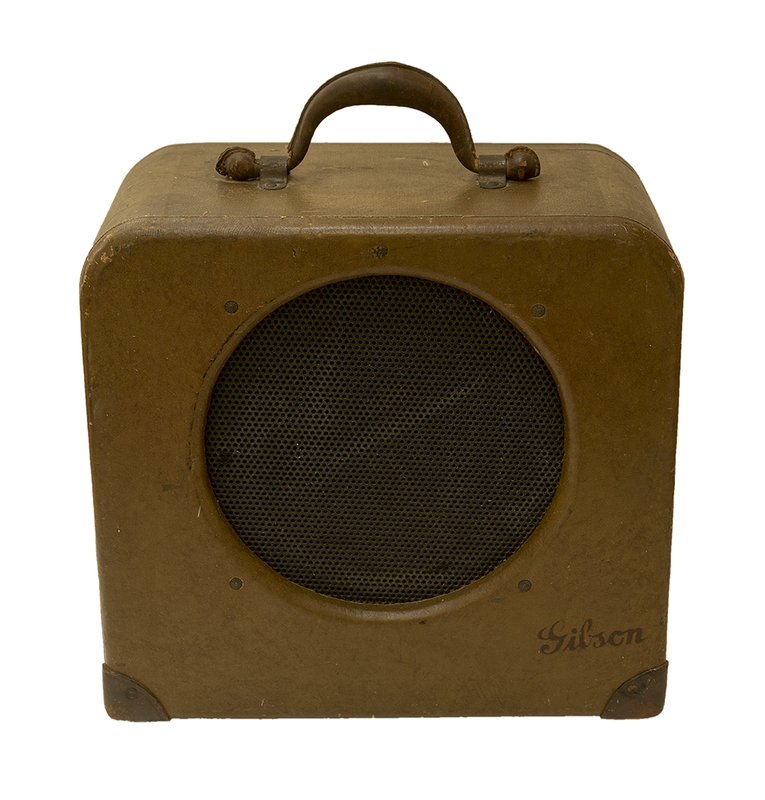 One of the earliest Fender instruments available, this Princeton Steel dates to the very first period of the Fender Electric Instrument Company, soon after the departure of "Doc" Kaufman and the changeover from the K&F partnership. 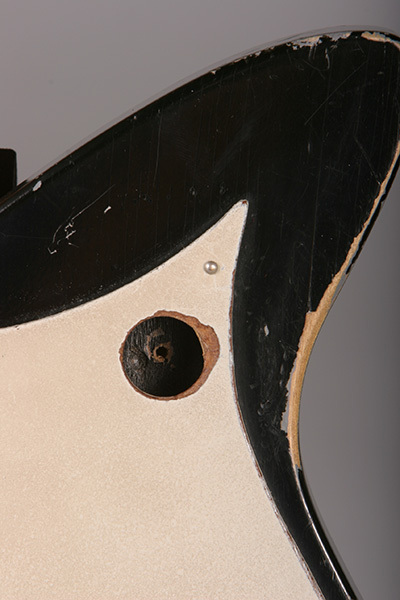 These early steels are the genesis of the entire Fender operation, which was a very small struggling local concern in 1947-8 with very limited production making all of these first instruments extremely rare. This example is in beautiful all original condition. Princeton serial numbers are distinguished by the prefix “A”. 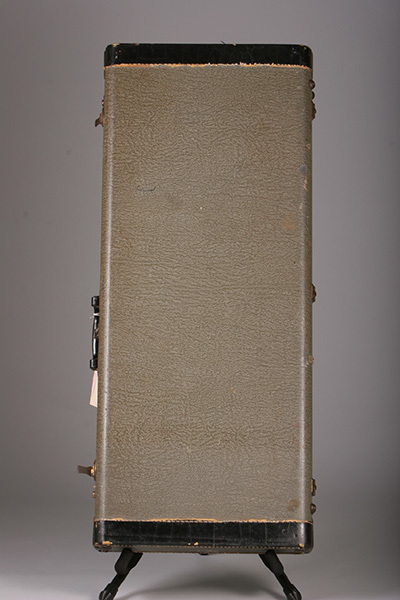 This example is number 158, an early serial number for a Fender guitar! The Princeton was the least expensive of a three-model line, but the differences in the instruments were relatively minor. The lack of a tone control and a hard-wired cord are all that separate this model from its slightly more upscale brother the Deluxe. All of these early steels were made of whatever woods Leo had in stock. The pickup is the famous Fender "Direct String" unit, which is still considered one of the best- sounding steel pickups ever designed. 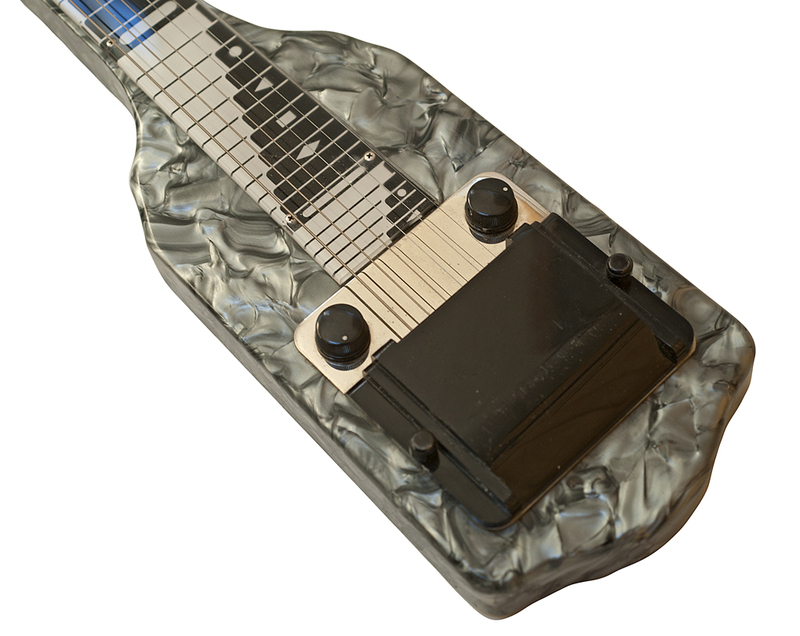 The aluminum fingerboard carries roman numerals designating the positions and headplate has the inscribed "Fender Electric instruments, Fullerton California" lightning bolt logo. 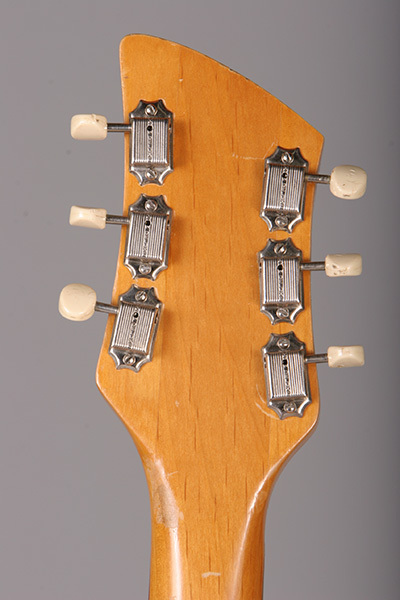 Original tuners are simple non-descript openbacks made by Waverly. 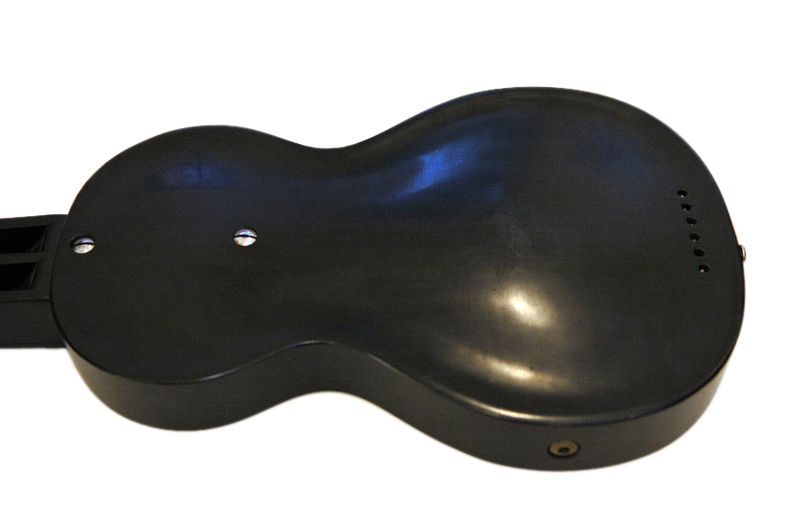 Despite its primitive appearance, this is a well-designed steel with a great sound. No case. 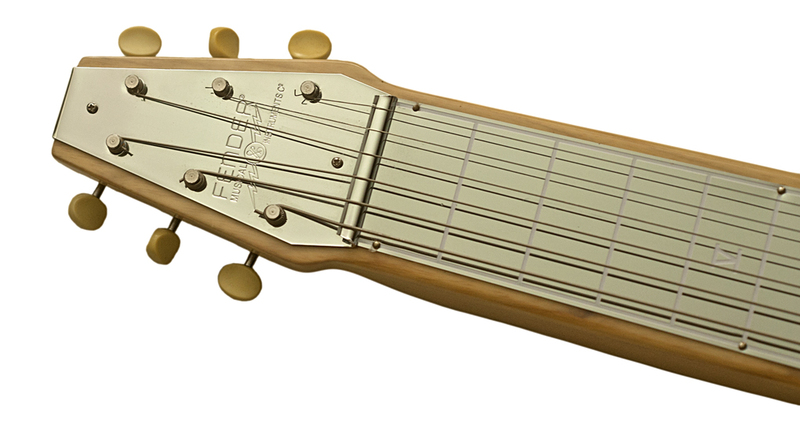 EXC!1950's Fender "Forrest White"Lap Steel"
A special version of Fender's Studio Deluxe produced to honor the Fender shop foreman Forrest White. entire site copyright ©1998 through 2016 Robert Corwin/Photo-Arts. All rights reserved.